Need a little extra encouragement in your health and fitness journey, well you’ve reached the right place. It’s the fourth quarter, 2018 is coming to an end and its time to get back into a structured workout routine. That’s right, it’s all systems #ONGO! Are you ready to hit “restart” on your fitness goals? We’ve got a 6-week-long challenge complete with workouts, a nutrition strategy, and advice along the way to help get you back on or kickstart your journey. Ready to get to it? Learn why recommitting to your fitness before the New Year is so effective, get some tips on how to be successful, and then accept our 6 – Week #ONGO fitness challenge! 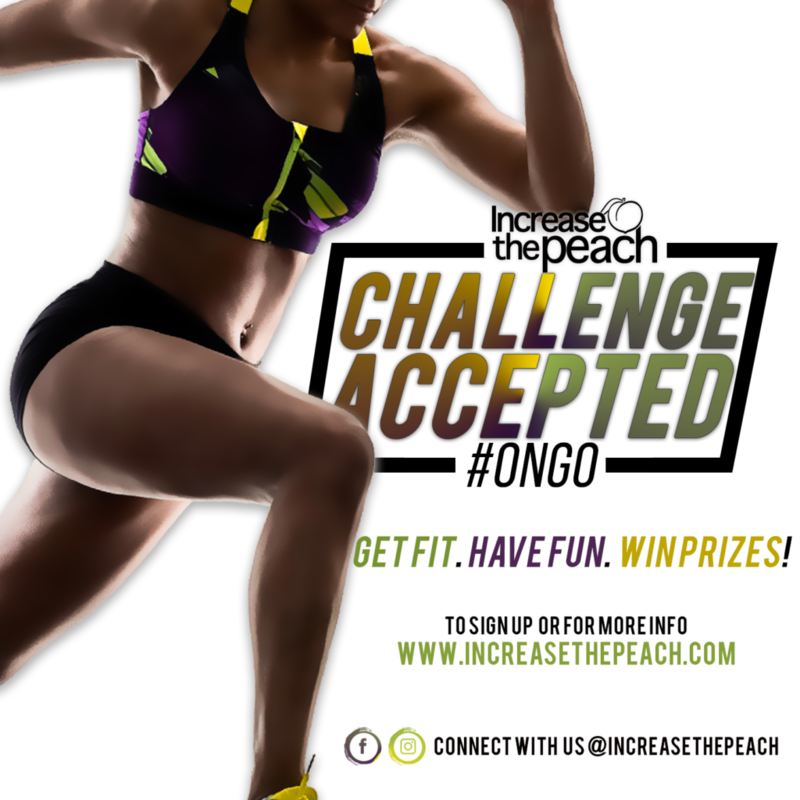 The goal of the #ONGOChallenge is to help you on your fitness journey if your goal is to lose weight, eat healthier or get stronger by motivating you to get moving! The concept: transform your lifestyle by creating common-sense healthy habits and earn points daily for making choices that ultimately improve your health. We provide the tools you’ll need to succeed – no diet, no fads. Overall health is our end goal and of course weight loss is often a pleasant side effect of incorporating healthy habits into your life. However, you do NOT need to lose weight to compete in this challenge. Then this challenge is for YOU! Waiting for the RIGHT time? The RIGHT time is when you start! The Challenge includes a 6-week training program that can be viewed from a smartphone, pc, or tablet! You can also download our nutrition strategy guide (PDF) to help you achieve maximum results. Participants must be a member of the #IncreasethePeach Community on Facebook and check- in daily throughout the challenge. Like & Follow the Increase the Peach Facebook Page. This entry was posted in Fitness Challenge and tagged Challenge, Fitness, Motivation, nutrition, Online. Bookmark the permalink. Do we do our own measurements? If you’re participating in SWFL your weigh-ins will be taken by Coach Chè. If you are not in the SWFL area you would be required to record and submit your weigh-in for it to be accepted. Will this coincide with my Gym Membership ? Is there any designated schedule/time? Yes, the workouts can either be completed at home or in a gym setting. For those participating in SWFL, we offer group workouts 6 times a week and a designated weigh-in time. If you’re not able to attend the weigh-in you’re allowed to submit a video recording during the designated dates and times.